Here daily we are going to present news items analysis from various sources. We don’t need to read news but need to generate views. Some news will be analytical, some would be factual and some would be merely informative. We need to use factual and informative news as an examples in our GS Papers and Essay answer writing. Analytical news will provide us a chance to discuss any matter in 360 degree angle, I meant, in multi-perspective. 2- Right to Privacy is a fundamental right ? Context: There is a case in SC where it has been interpreting the constitutionality of Right to Privacy through the prism of Fundamental rights that means whether it comes under Part III of Indian constitution or not? The right to privacy is not explicitly mentioned in the Constitution. But then the right to “due process” too was not there. If the text of the Constitution alone is going to determine the nature of the right to privacy, then the collegium system, the right against arbitrariness and the freedom of press too could go soon. As none of the above features are mentioned in Indian constitution. What if Right to privacy is not a FR? Right to privacy subsumes under right to life and personal liberty. Without right to privacy, right to life cant exist. In Kharak Singh (1963) case where a dacoity accused was released and put under surveillance. Police constables would knock at his door, wake him up during night and disturb his sleep. The judiciary conceded that “everyman’s home is his castle” and struck down surveillance over Kharak Singh. But the court said that there was no fundamental right to privacy in India. In the Gobind case (1975), court has recognised right to privacy as an integral part of right to personal liberty. Today, liberty is a part of the basic structure of the Constitution. In ADM Jabalpur (1976) judiciary accepted the government’s argument that when the right to life and personal liberty is suspended, citizens have no remedy against illegal detention. Q- Denial of privacy neither promotes national security nor curbs terrorism, it merely takes away citizen’s freedom to be left alone and curtails his/her choice in personal decisions. Critically examine! Context: To avoid any conflict of interest, MPC members are asked to disclose assets. The Monetary Policy Committee (MPC) is a committee of the Reserve Bank of India, headed by its Governor, which is entrusted with the task of fixing the benchmark policy interest rate to contain inflation within the specified target level. For every bi-monthly monetary policy meeting, the decision of increase/decrease in interest rates and money supply would be decided by MPC throught votes. In case of a tie, Governor’s vote will decide the decision forward. Context: Bangladesh and India have signed a memorandum of Understanding (MoU) to connect the North-East and West Bengal with Bangladesh through new waterways. 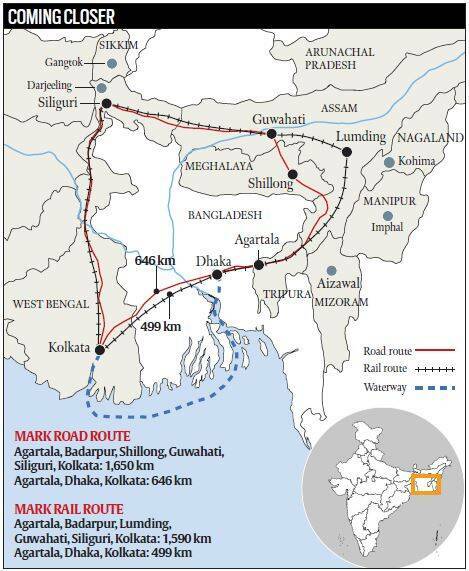 1) India and Bangladesh share a 4,095-km border, of which 1,116 km is through rivers. 2) Bangladesh receives water from 54 rivers in India. 3) New Water ways will help in India’s ‘Look east’ or ‘Act East’ policy. 4) The signing of the Coastal Shipping Agreement, the renewal of the Trade Agreement and the Protocol on Inland Water Transit and Trade, as well as the flagging off of new bus services are examples of connectivity across the region to reduce inequalities and maximizing welfare gains. 6) Connectivity between the two countries by road, rail, rivers, sea, transmission lines, petroleum pipelines and digital links are poised to increase trade, prosperity and decrease the poverty in south Asian countries. To explore the multi-faceted Indian Ocean ‘world’–collating archaeological and historical research in order to document the diversity of cultural, commercial and religious interactions in the Indian Ocean. To focus on Monsoon patterns, cultural routes and maritime landscape. Intangible cultural heritage is defined as the practices, representations, expressions, as well as the knowledge and skills (including instruments, objects, artifacts, cultural spaces), that communities, groups and, in some cases, individuals recognise as part of their cultural heritage. Join our whatsApp Group at 8860736263 to clear any doubt. To join, you need to send WhatsApp message with your name and batch details to above listed mobile number. One warning: Don’t misuse this facility in inter-communicating with each other and no personal messages need to be sent to any other member. If you have any issue, you can directly send to us at 8860736263.